Want to move through an awesome workout without the bulk of heavy equipment? Resistance bands are all you need. Convenient, versatile, and low-maintenance, these sturdy elastic tubes are a great addition to your exercise routine: They build strength, develop the mind-muscle connection, and improve flexibility. Not sold on the idea of exercise bands yet? Check out these great benefits, and try a quick workout routine to get your muscles pumped and heart revved. Resistance bands offer the perfect alternative to a workout at the gym or as a way to keep active while traveling. They are easy to store and offer a variety of exercise options with minimal equipment. Unlike big machines, resistance band movements are relatively easy to pick up. This makes jumping into a new routine a breeze. From a first-time exerciser to pro athletes, exercise bands are useable across different fitness routines. Though they seem more fit for a novice than weights or machines, elastic bands give even the strongest athletes an intense workout. Whether you travel for work, are on vacation, or want to take your workout outside, exercise bands can be easily packed and used in small spaces. Toss them in your work bag for a quick lunch workout, or in your suitcase for your next getaway. A set of resistance bands won’t break the bank. Compared to other gym equipment, such as dumbbells, kettlebells, and medicine balls, resistance bands are typically the least expensive. With a good set of resistance bands, you can work your body from head to toe. Bands come in a variety of shapes, sizes, and strengths, so you won’t short a single muscle group in a given exercise routine. Now that the benefits are obvious, let’s decide which resistance bands fit your needs. Most bands work well for any workout, but some target specific muscle groups better than others. 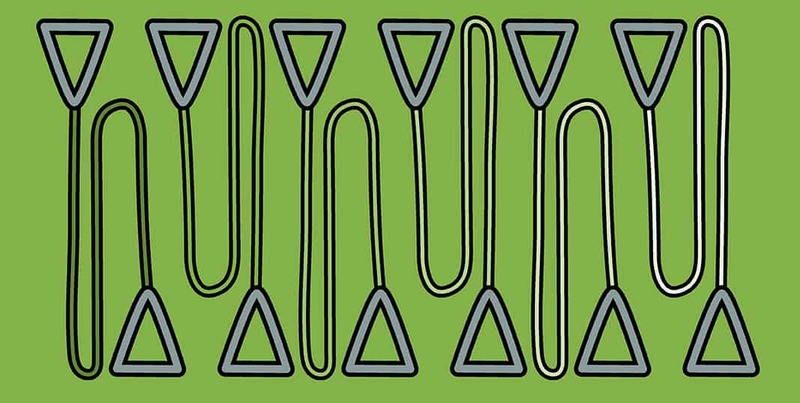 These bands are made of a single piece of rubber that connects from end to end to create a closed loop. They come in a variety of strengths and work well for stand-alone exercises or as an accessory to assist deadlifts, squats, pull-ups, and more. These bands are most common and work well for a full workout routine. They store easily and a single band can be used a variety of exercises. The bands come two ways: sets with detachable handles or as individual bands. Though small, these bands are mighty. They’re best suited for isolated work that targets glutes, hamstrings, and quads. Physical therapists also use these bands to help stabilize movement in upper body exercises. Therabands are thin, latex-free sheets with open ends. Often seen in yoga and Pilates studios, these bands are versatile because they can be tied together to create different resistance levels. Deciding which type and strength of resistance band to use can get a little tricky. If you’re new to bands, choose a lighter strength for upper body moves and a moderate strength band for lower body moves. Heavier loop bands can be used as an accessory for assisted pull-ups and to intensify some weight lifting moves. For standard workouts, light- to medium-strength works best. Start simple with one or two bands and decide later if you want to add to your equipment stash. Door attachments are a great addition if you need to fix your bands in different positions. They are inexpensive and may come with resistance bands sets. Ankle straps are another good accessory to aid lower body exercises, such as hip abductions and hamstring curls. Work your body from head to toe with this full-body exercise band routine. Resistance bands provide a lot of bang for your buck. They’re perfect for travel days, busy schedules, and tight budgets. Pick up some bands today, and be on your way to a stronger, healthier body in no time. Kellie Davis ran before she crawled and is constantly feeding her insatiable appetite for competition. In 2009, she competed in her first figure bodybuilding show and subsequently started a fitness blog titled MotherFitness.com to help other moms and career women make positive fitness and lifestyle habits. Her blog spring-boarded her fitness writing career, and shortly after she was in the gym coaching clients. Davis discovered the perfect marriage of fitness and writing, and has since co-authored the popular women's strength training book Strong Curves, launched a handful online fitness programs, and is also the co-founder of GetGlutes.com, a comprehensive intermediate resistance training system. As a fitness writer and personal trainer, she is known for helping hundreds of women achieve optimal health through her innovative fitness programs designed for those with a busy lifestyle. In her spare time, Davis dotes on her amazing husband and two children, attends The George Washington University as a graduate student, competes in powerlifting, takes the field in co-ed softball, and spends time with her two adoring dogs and brood of backyard hens. Great post! I think band exercises are great for all levels. It’s the perfect way to spice up your fitness routine. Thanks for sharing! We’re so glad you enjoyed our article!